There is something about a candle in Autumn. Even a small flame gives off heat as we adjust to new temperatures outside. Something as simple as looking at a warmly-lit candle can heat me up from the inside out. Temperatures have fallen here in NE Ohio and my neighbor friend and I enjoyed a craft that can be enjoyed of all ages, from 4 years old to 37 and older. 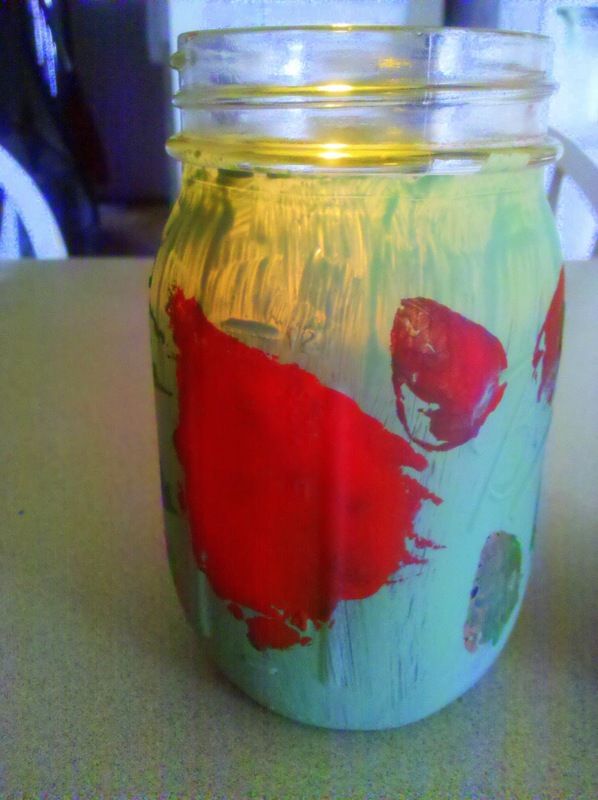 A glass jar. 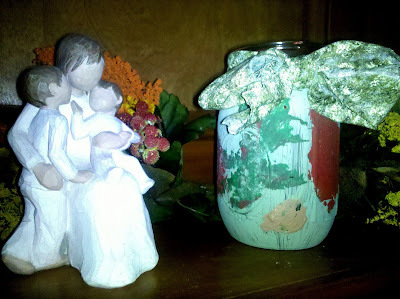 We used two mason jars that I have used for canning garden veggies in previous years. You can also make smaller candle holders with baby-food jars. This is a great job for recycling so find a glass jar that you no longer use. Acrylic paints and paint brushes. I happen to have a box of these in my basement that I have used for stamping my walls years ago. Regular 'kid friendly' paint isn't going to work because it won't stick to the glass. If you ever see acrylic paints on sale grab a few. They can be great for crafting. A tea light or other candle. I happen to have a few candles that I had used as decoration. It was nice to not have to run out and buy one but just 'repurpose' my older green candles from the knick-knack shelf. Some ribbon or material. You will use this around the rim of the candle when you are done. 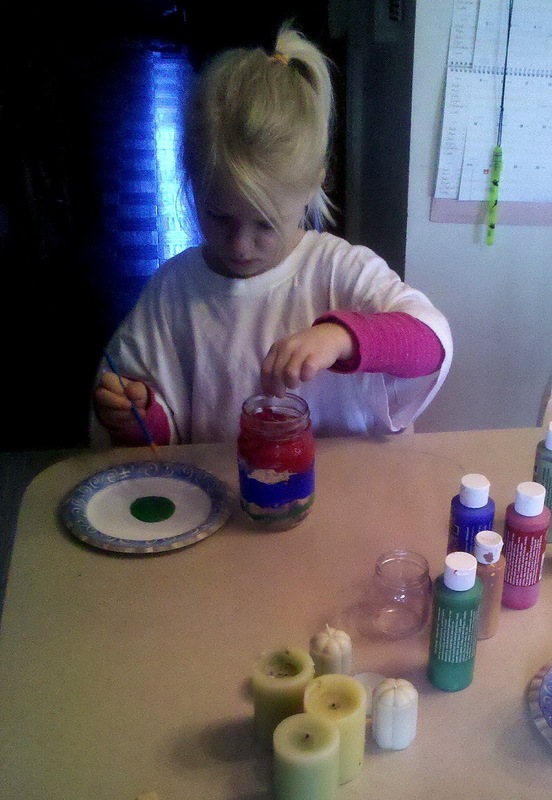 Start by painting the jar. I covered mine in one color but my four year old counter part enjoyed making designs with several different colors. The choice is yours! 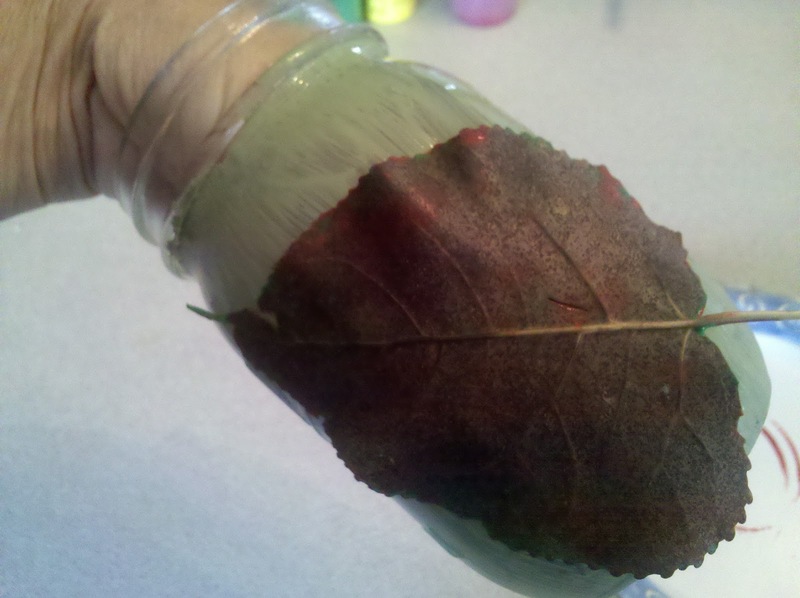 When your jar is dry to the touch you can add your leaf impression. Dry the leaves off well and then paint one side of the leaf. Press onto your jar being careful not to smudge. I used my paintbrush and painted the side showing as well. This was the simplest way to be sure it was completely pressed into the glass. Repeat this step until you get the look you want. 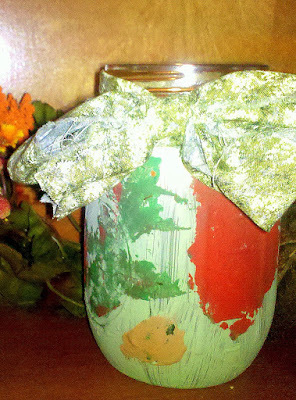 Next tie your ribbon around the rim and then add your candle. This makes a great autumn decoration and a whole lot of fun for the kids as well. I love to watch their minds get creative. It could also be a great MOPS or other spouse type of project. Isn't it fun to sit down, do a project and have it all completed? This can be completed in thirty minutes, a must-do! Here is to autumn nights, warm apple cider, a good book snuggled under a blanket, and beautiful candles decorations.